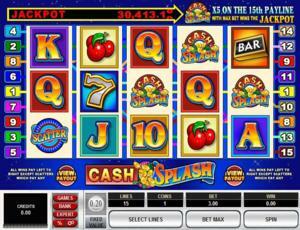 Cash Splash 5-reel is an online video slot machine game released in January 2004. It is offered exclusively at online casinos powered by Microgaming. This online video slot machine game has 5 reels and 15 pay lines. The Cash Splash 5-reel slot machine game is actually a sequel to the very popular Cash Splash online slot game, which has 3 reels and only 1 pay line. Just like its predecessor that has a Progressive Jackpot waiting for a lucky winner, Cash Splash 5-reel online video slots also offers a Progressive Jackpot for every real money player! The Cash Splash 5-reel online video slot game actually shares its Progressive Jackpot with the classic Cash Splash 3-reel online slot game. Did you know that the 3-reel Cash Splash is considered to be one of the first Progressive online casino games that Microgaming released? Even if Cash Splash has been around for years, it is still popular as it is played by hundreds to thousands of people every day. If you are one of those who enjoyed playing the 3-reel version of Cash Splash, then for sure you will totally love playing its 5-reel version! Microgaming online slot games are available to players in 2 formats – download and no-download. Whether you like to download their software first or you prefer to play instantly without the need to download, then Microgaming surely has online slot machine games to accommodate your every slot gaming preference. Cash Splash 5-reel is a slot game that belongs to the download category, which means you must download first before you are able to play this particular slot game. Also, this particular slot game is available for Real Money Players only. The Cash Splash 5-reel online video slot game features 5 reels and 15 pay lines, scatter wins, a wild symbol that can reward you the Progressive Jackpot if you get 5 of them lined up on the 15th enabled pay line, a maximum coin jackpot of 6,000 coins, and a progressive jackpot which can reach to $30,000! Microgaming software provides state-of-the-art graphics and sounds that are considered to be absolutely outstanding. They have a great reputation of continuously making the most stunning graphics and superb sound effects. A lot of online slot players love Microgaming because its online slot games have smooth animation and astonishing yet non-intrusive background music and sound effects. Since it is essentially a no-frills type of slot game, Cash Splash has been designed to look like a simple classic slot game with matching sound effects. The Cash Splash logo shows coins and cash to be spilling out, probably emphasizing the impending “splash” of prizes that you may possibly win in this slot game. The background color of the reels is a solid blue. The other colors used in this slot game are gold, green, purple, red, orange, yellow, silver, black and white. In Cash Splash 5-reel slots, the background music and sound effects you will hear are very similar to the ones you will find in land-based casinos. Whenever you spin the reels and form winning combinations, simple sounds common in land-based traditional slot games are played out. The regular card deck symbols available in the Cash Splash 5-reel online video slot game are 10, J, Q, K and Ace. The regular symbols that you will find in the Cash Splash 5-reel slot game are the Money, the Bar, the Seven, and Cherries. The Wild symbol is the Cash Splash Logo. The Cash Splash Logo wild symbol acts as a substitute for all other symbols (except for the scatter symbol) in order to you help you form winning combinations. Multiple Cash Splash Logo wild symbols, on an active pay line, complete a winning combination (see payout table). If you are aiming for the Progressive Jackpot, and you get 5 Cash Splash Logo symbols lined up on the 15th enabled pay line, you automatically win the Progressive Jackpot! The Scatter symbol is the Blue Scatter symbol. The scatter symbol is not required to appear in a line (on an enabled pay line) for you to win. The Blue Scatter symbol can be found scattered anywhere on the 5 reels, and you are able to form winning combinations as long as there are 3 or more Blue Scatter symbols that appear. Your winnings are calculated by multiplying the Blue Scatter symbol combination payout (refer to the Payout table) by the total number of coins you’ve bet. Please take note that if you get a scatter win and a regular win, then you are paid out for both of these wins, because the Blue Scatter symbol is not required to come out on an enabled pay line for you to win. Scatter awards are independent from pay line awards, and thus they are added to the pay line win. Just like its super popular 3-reel version, the Cash Splash 5-reel online video slot game does not have any Bonus Features, but it does have an awesome Progressive Jackpot up for grabs! The Cash Splash 5-reel online video slot game has a progressive jackpot to greatly reward its loyal players! A progressive jackpot is described as a continuously-accumulating prize, and the most recent value of the Progressive Jackpot is showcased at the top area of the Cash Splash 5-reel online slot machine game. You are only eligible to have the chance to win the Cash Splash Progressive Jackpot if you wager the max bet of 15 coins per spin, which means 1 coin per pay line. If the Progressive Jackpot is enabled and you obtained 5 Cash Splash Logo symbols line up on the 15th active pay line, you will win the Cash Splash Progressive Jackpot! Online slot players all over the world are notified when the Cash Splash Progressive Jackpot has been won, and then it will reset to its fixed minimum value. Whenever there’s a progressive jackpot up for grabs, you will always be reminded that in those games, the more you bet, the greater your chances of winning the Progressive Jackpot! Please be reminded that only Real Money Players are qualified to win the real money Progressive Jackpot slot games. Cash Splash 5-reel slots has 5 reels where you may bet on 15 pay lines. The betting amount is fixed at 0.20 per line. You can wager from 1 up to 15 coins per pay line. Thus, the minimum amount you can bet is 0.20 and the maximum amount you can bet is 3.00 per spin. The Progressive Jackpot is enabled when you wager the max bet of 15 coins. The Cash Splash 5-reel online video slot game can only be played by Real Money Account users. The maximum payout other than the Progressive Jackpot in the regular Cash Splash online slot game is 6,000 coins. Online video slots are much easier and more fun to play when it has an Autoplay function. In Microgaming online slot games, they have 2 game modes – Regular mode and Expert mode. If you would like to play the Cash Splash 5-reel online video slot game automatically, all you need to do is access the Autoplay function by clicking on the “Expert” button located at the left corner of the game screen. In it, you will find the Autoplay setting that lets you play a desired number of consecutive spins automatically.